Haymes’ article is now available to read online. Thanks to Stephen Copson for the update. Brian Haymes article, based on a recent lecture, is required reading for anyone who has only read the most famous quotations from the flyleaf of James I’s copy of Helwys’ book. 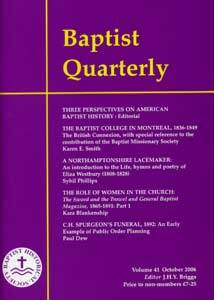 The issue also gives advance notice of the Baptist Historical Society Centenary Summer School to be held in Prague on 16-19 July 2008 (for information about what is happening in Prague during that month see here and here). The theme of the conference will be ‘Baptists and the World: Renewing the Vision" and Bill Leonard, Ian Randall and Toivo Pilli are already lined up to speak.